Bearcat is concerned for the environment and in finding ways to reduce waste and maximize the recycling possibilities for our products. In Sri Lanka SOLIDEAL/LOADMASTER manufacturing facilities have targeted and received the ISO 14000 environmental certification. Being part of the SOLIDEAL group of companies means we are also proud members of a number of globally recognised environmental programs and dedicated to being at the forefront of change for our industry. SOLIDEAL is currently embarking on a “return & recycle” tyre program through it’s 60 distribution and service locations throughout the world. From the outset: Our Solideal tyres are manufactured using natural rubber; which is not only the premium ingredient for a good quality tyre but a much more environmentally friendly material. We are part of a global group investigating better ways to minimise landfill of used products. Nationally we use environmentally friendly tyre recyclers that promote the reuse of rubber for applications such as road construction. Futhermore we supply used solid tyres for re-use on agricultural plowing equipment in rural areas. 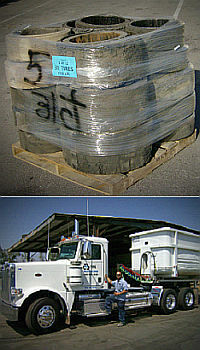 Tyre disposal is priced dependent on tyre size. Contact Bearcat for further information.